Cessna 152 ZK-TOD (Cessna A). Courtesy of Flight Training Manawatu. 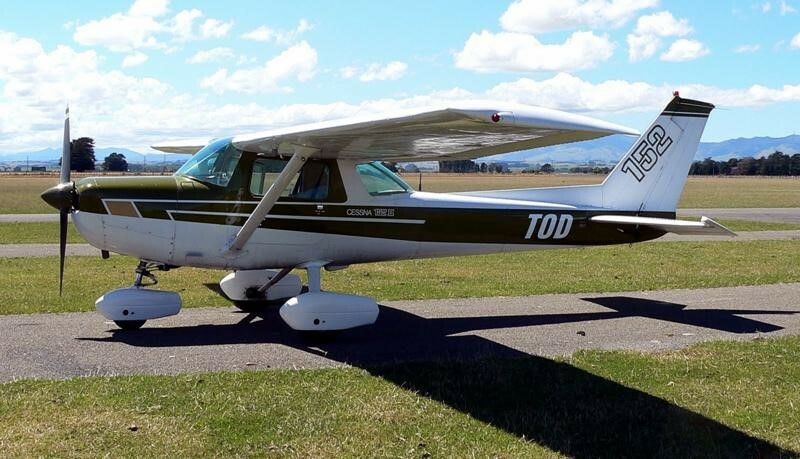 On Monday 26 July 2010, two Cessna 152 aeroplanes were being used for training flights in the vicinity of Feilding Aerodrome. One was climbing away from the aerodrome circuit with a solo student pilot on board and the other was returning to the aerodrome circuit with an instructor and another student pilot on board. The 2 aeroplanes collided at an altitude of 1300 feet about 1100 feet above the ground. The aeroplane with 2 on board lost part of one wing in the collision and became uncontrollable. It was destroyed when it crashed, killing both occupants. The engine on the other aircraft was damaged in the collision and soon stopped, but the solo pilot was able to glide the aeroplane back to Fielding Aerodrome and made a successful landing. That aeroplane was extensively damaged but the pilot was uninjured. Both aeroplanes were flying in uncontrolled airspace under visual flight rules (VFR). They were constrained by a 1500-foot altitude limit, above which was controlled airspace for aircraft flying into and out of Ohakea and Palmerston North Aerodromes. The 1500-foot limit meant that aircraft arriving at and departing Feilding Aerodrome were generally forced closer together than would be normal at other aerodromes. The pilots of both aircraft were making the required radio calls announcing their locations and intended flight paths, but in spite of this neither the instructor nor the students appear to have recognised early enough to prevent the collision that they were on converging paths. The surviving pilot did not see the other aeroplane before the collision. It was not possible to determine if the flying instructor and student in the other aeroplane saw his plane before the collision. One reason for the 2 aeroplanes colliding was that the pilots of both aircraft appear to have either not heard or heard and not comprehended the importance of the radio calls of the other aircraft. Radio calls reporting an aeroplane's position and intended flight path help pilots to build full mental pictures of the situation. Knowing what aircraft were in their vicinity would have helped the pilots to locate and avoid those aircraft, a concept known as “see and avoid”. See and avoid is a fundamental requirement for flight under VFR. The Transport Accident Investigation Commission (the Commission) made findings about the importance and known limitations of the see-and-avoid concept, the overall risk of mid-air collisions, and the use and viability of aircraft lighting and technology that could further reduce the risk of mid-air collisions involving general aviation aircraft. The Commission made 3 recommendations: the first on the requirement for instructors to ensure first the safety of their aircraft before attending to their students; the second for pilots to improve their active listening skills, to help form accurate mental plots of the locations of other aircraft and therefore assist in seeing and avoiding those aircraft; and the third for operators and pilots to use high-intensity strobe lighting to help ensure their aircraft are as visible as possible. - pilots need to be aware of the limitations of the human eye and understand how this can affect their ability to see and avoid other aircraft.